John Edwards seemed a little greasy in the 2004 election, but these days he makes the performance three years ago look positively principled and decent. Everybody knew that Edwards made his fortune as an ambulance chasing plaintiff attorney, and his pleadings on behalf of the country’s poor came across as a shallow effort, but the once and present candidate either isn’t a quick study, and didn’t learn anything on that score, or he figures that people really don’t care about such things. But some of us do care about things like hypocrisy, and John Edwards seems up to his neck in it. Edwards’ poverty center was up and running during the 2004 campaign, and that seems appropriate for someone who claims to want to help the poor, right? Business Week magazine tells us, however, that the center was housed in the same office as his political action committee. Convenient, eh? What’s more, the nonprofit center reportedly spent an astounding 70 percent of the money it raised for the poor to fund a speaking tour for Edwards, and on staff salaries for folks who, it turns out, not long thereafter signed on with the Edwards presidential campaign. Real nonprofit organizations operate on a fraction of their funding, rather than on most of it, and real nonprofits don’t funnel employees to political campaigns. Edwards gave a speech a few days ago at the University of California, Davis, titled, "Poverty, the Great Moral Issue Facing America." So, Edwards continues his work to help the poor, right? Maybe not. News reports tell us that he received $55,000 for the appearance, and that the poor students who attended were charged more than $17 a ticket. Further, during the 2004 presidential campaign Edwards told us of his humble beginnings in a little house he grew up in that was all his mill worker father could afford. Once again, however, the truth is a different story than the one Edwards tells. Yes, he did live in that little house, until he was a year old. After that, mom and dad and Johnny found themselves movin’ on up, thanks to his father’s promotion to a management position and enough of an increase in income to keep the Edwards forever above the poverty line. Funny, we didn’t hear about that in the campaign ads. Now, John and Mrs. Edwards tough it out in a 28,000-square-foot house with six bathrooms and ignore the poor folks in the mobile home park across the street as they pass by. 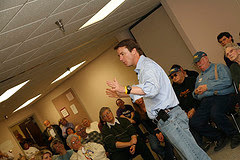 So much for John Edwards, the politician and hustler, whose pandering to the poor has shown him as unfit to be President of the United States. But as tawdry as his poverty pimping is, that’s not the worst of it. Just last week Edwards gave a major foreign policy speech in which he labeled the war on terror a bumper sticker slogan. With this absurdity John Edwards separates himself from reality. Not only is Islamic terrorism a very real threat to his country, but he seems to have forgotten how adamantly he supported the war on terror in 2004, when he complained that the Iraq war was distracting us from fighting terrorism. Seems like the overriding concern in what John Edwards really stands for is how many votes it will get him. That isn’t unusual in politics, even in presidential politics, but those aren’t the people we want to elect. 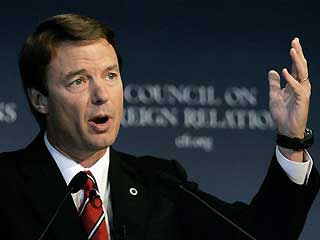 So we should bid John Edwards a fond a swift farewell from the political arena. He doesn’t have what it takes.